Please click here to visit my new research page at Queen Mary, University of London. I am currently Lecturer in Digital Media in the Centre for Digital Music at Queen Mary, University of London. Previously, I was a post-doctoral researcher in the Music & Entertainment Technology Laboratory (MET-lab) at Drexel University, supported by a CIFellows grant from the Computing Research Association and National Science Foundation. My research aims to quantify aspects of creative musical expression, particularly the interaction between performer and instrument. Efforts to establish an artistic role for computing are often hindered by a mutual lack of understanding between musicians and computer scientists. The problem is partially one of terminology: engineers tend to analyze audio signals in terms of amplitude, frequency and spectrum, where a musician might hear dynamics, intonation and timbre. The relationship between these qualities can be surprisingly subtle. Other musical parameters, such as gesture or character, are extremely difficult to quantify. I aim to reconcile musical and technical perspectives by using computing to augment, rather than replace, existing musical instruments. My approach is twofold: first, by integrating high-resolution sensors into existing instruments, performance gestures can be analyzed in detail and correlations drawn with expressive intent. Second, electronic actuation can be used to manipulate an instrument's acoustic properties, creating hybrid instruments blending the natural richness of acoustic instruments with the flexibility of electronic synthesis. The magnetic resonator piano is a hybrid acoustic-electronic instrument augmenting the traditional grand piano. 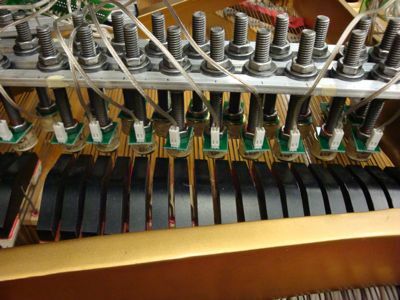 Sound is produced without loudspeakers using electromagnetic actuators to directly manipulate the piano strings, expanding its vocabulary to include infinite sustain, notes that crescendo from silence, harmonics, and new timbres. A sensor on the keyboard reports the continuous position of every key. Time and spatial resolution are sufficient to capture detailed data about key press, release, pretouch, aftertouch, and other extended gestures. The system, which is designed with cost and setup constraints in mind, seeks to give pianists continuous control over the musical sound of their instrument. More information on the MRP can be found at my MET-lab research page. The piano keyboard remains the interface of choice for many digital music tasks, but interest is growing in the musical applications of multi-touch interfaces. Though devices such as the Apple iPad offer continuous, detailed tracking of multiple fingers, touchscreen devices lack the tactile feedback of traditional musical instruments. This project integrates multi-touch sensing directly into the keyboard itself through the use of specialized key tops. Each key top is a capacitive sensor capable of recording the position and contact area of up to three fingers on the key surface. Black keys sense touch in a single lengthwise axis; the front of the white keys also sense horizontal position. Touch data is sent to a computer by USB, and Open Sound Control messages are provided for a wide range of low- and high-level gestures, allowing connections to many synthesis platforms. 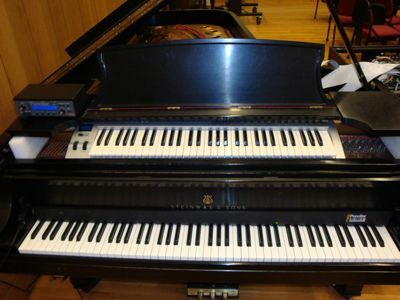 The keys can be installed atop any existing acoustic or electronic keyboard. A. McPherson and Y. Kim. Design and applications of a multi-touch musical keyboard. To appear in Proceedings of the 8th Sound and Music Computing Conference (SMC 2011), Padova, Italy. B. Dolhansky, A. McPherson and Y. Kim. Designing an expressive virtual percussion instrument. To appear in Proceedings of the 8th Sound and Music Computing Conference (SMC 2011), Padova, Italy. A. McPherson and Y. Kim. Multidimensional gesture sensing at the piano keyboard. In Proceedings of the 29th ACM Conference on Human Factors in Computing Systems (CHI 2011), Vancouver, BC. A. McPherson. 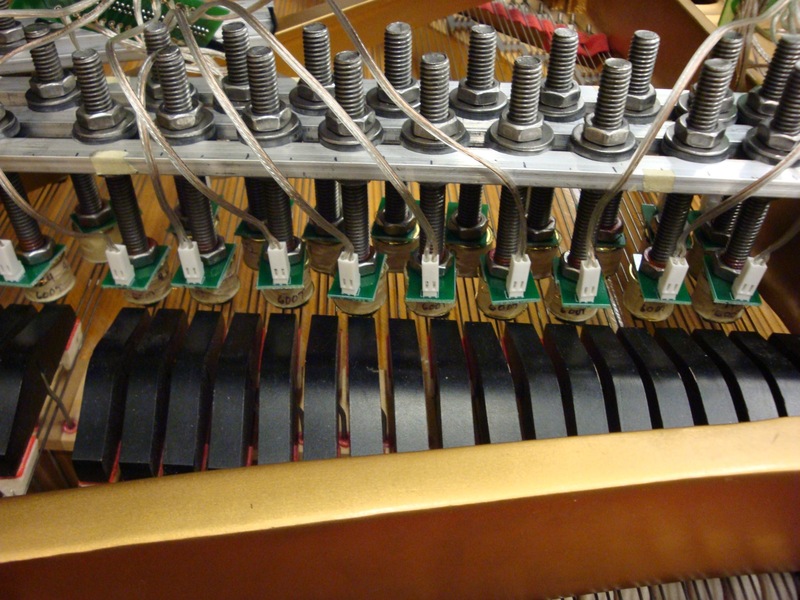 The magnetic resonator piano: electronic augmentation of an acoustic musical instrument. Journal of New Music Research 39 (3), 2010, pp. 189-202. A. McPherson and Y. Kim. Augmenting the acoustic piano with electromagnetic string actuation and continuous key position sensing. In Proceedings of the 2010 International Conference on New Interfaces for Musical Expression (NIME 2010), Sydney, Australia. A. McPherson and Y. Kim. Toward a computationally-enhanced acoustic grand piano. In Extended Abstracts of the 28th ACM Conference on Human Factors in Computing Systems (CHI 2010), Atlanta, GA. I will present a paper, Piano touch as a model for expressive gestural interaction, at the BCS HCI 2011 conference, in the workshop When Words Fail: What can Music Interaction tell us about HCI?. 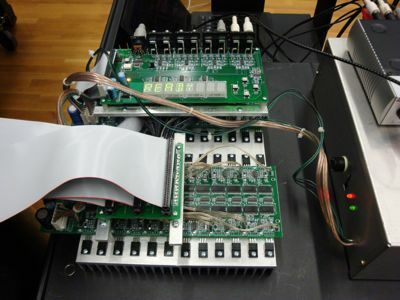 Seminar and demo: Electronically Augmenting the Acoustic Piano: Explorations of Resonance and New Techniques for Continuous Note Shaping. NYU, Music and Audio Research Lab, Department of Music. MRP demo and performance at the FAST Festival, MIT Media Lab, celebrating MIT's 150th anniversary. MRP demo and performance, Tanglewood Music Festival. 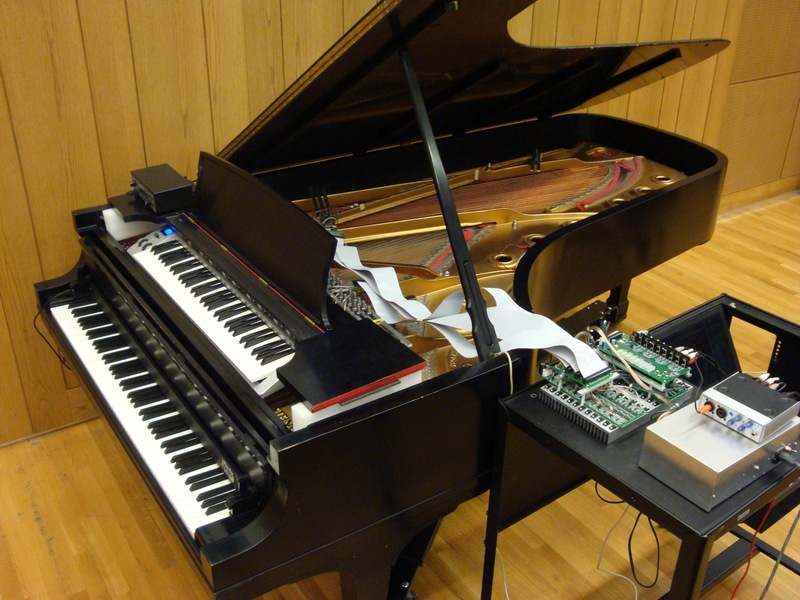 Seminar: Augmenting the acoustic piano with electromagnetic string actuation and continuous key position sensing. Stanford University, Center for Computer Research in Music and Acoustics (CCRMA). Live demo and workshop with composition students at the Curtis Institute of Music. MRP research presentation and demo, Guthman Musical Instrument Competition, Georgia Tech. Chosen as competition finalist. Seminar: Electronic Augmentation of an Acoustic Musical Instrument. Drexel University, Department of Electrical and Computer Engineering. Seminar: Living Resonance: Compositions and Augmented Piano, Wellesley College. CrossoverUnit Digital loudspeaker crossover design using Apple's AudioUnit architecture. SoundBlocks Master's thesis: a set of interconnectable blocks for children to explore music and audio manipulation.